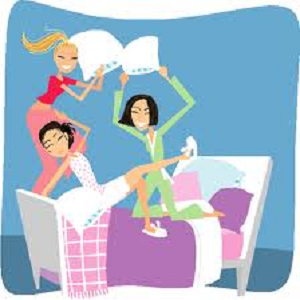 A slumber party is a fun way to spend a night with all your girls, and have the time of your life. Nobody ever sleeps at a slumber party because there is just so much to do. There are many ways to make this night fun and exciting. Plan the activities in advance by keeping all your friend’s interests in mind. There needs to be food, games, pajamas, pictures, and a lot more. It also gives you time to gossip, laugh and share stories with your friends. If you are looking to have a great slumber party, there are some activities which are guaranteed to make it a fun one. A slumber party is the perfect time to give each other makeovers: take out your makeup boxes, jewelry, and each others' glamorous clothes and dresses. The girl who is good at makeup can do that for everyone, while another can make combinations of what to wear and match the jewelry with it. Everyone can come up with different looks of their own choice: retro, hip hop, classy, contemporary etc. Once all the makeovers are complete, take lots of pictures to capture these memories. You could also appoint one judge to choose the best look. When girls are together, they like to cook. Think of a favorite recipe and assemble the ingredients beforehand. Divide the chores and cook a late night snack for each other, because everyone tends to get hungry late night. Some of the options are: caramel popcorn, cucumber sandwiches, grilled cheese, mac and cheese, etc. You could also bring out your creative side by making fun drinks: decorate the glasses with colored straws, citrus, and some cherries. Truth and dare: the game is not unknown to anyone. It brings out everyone’s secrets and tests how daring they are. A bottle is spun in the middle with the players in a circle. Wherever the bottle stops, the person has to answer. If a person chooses truth, they have to answer any personal question that is asked by the others truthfully. It is the best way to share secrets. The second option is to choose dare: the others think of any fun and crazy task and you have to perform it. Music and dance complete any party; they bring life and excitement to the surroundings. Put on your favorite tunes and dance your heart out. One of the girls can be the DJ and make the playlist. Every person can give a performance on their favorite song. This will ensure that everyone is participating and having fun. How to Enjoy an Outdoor Concert in Washington, D.C.